How can I add Booking.com? HOME > CHANNEL MANAGER > How can I add Booking.com? Both platforms have a payment method match. There are no XML offers RES on Booking.com: It means that they will not be updated via XML (rates and availability). STEP 4: After revising all the options and agreeing them on Stage 2, GuestCentric will receive an email to approve the connection. Please be in touch with us in order to confirm the connection as soon as possible in order to pass through Stage 3. STEP 5: After Guestcentrinc approving the connection, Enter on Guestcentric application and go to SETUP - CHANNEL SETTINGS. NOTE: Again, make sure you have all offers created on Guestcentric in order to be able to map with the rooms and deals available in the channel. STEP 6: Select the channel Booking.com and double-click to open. STEP 7: Add the user details and password in the corresponding fields. STEP 11: Click on the ADD button and make sure that it is possible to click and view the hotel's inventory. Make sure that the entire inventory of hotel is connected with the inventory available in the channel. In the "Channel Room Type Name" you can not can leave any inventory left to be connected. All options should be gray at the end. STEP 12: Click SAVE for each combination and continue to add the remaining inventory. 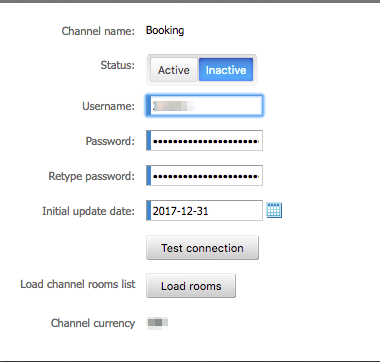 STEP 13: Then connect all offers with the ones you have on the channel, in order to load the rooms available in the channel. STEP 14: Click SAVE on each combination and continue to add the remaining room types. STEP 15: Save as "INACTIVE". STEP 16: When the mapping setup is done, contact us so we can authorize the connection. STEP 18: Once the activation on Booking.com is done your account will be reset. So now you will need to return to the backend of GuestCentric. SETUP - HOME - CHANNEL SETTINGS. STEP 19: Select the Booking.com channel, click on ‘Edit’ and then click on ‘Active’. If there is any error, please read the message and contact our support team if you have any doubts. With the sucessfull message, you must proceed with to validate all offers, simulating searches on Booking.com as if you were the client and assure that all offers are shown as expected. Check different dates. The Booking.com will clear rates and availability during the update process, that is why the last step must be performed in the shortest time possible to prevent that the hotel is unavailable for to long on booking.com. Make sure you that have at least one year with rates and availability loaded on Revenue [on GuestCentric platform]. Review your booking engine availability and ensure that Revenue's availability is correct before activating integration with Booking.com. Please note that bookings made earlier in Booking.com will not be imported to your list of reservations, so it's important to make sure that you have the availability updated accordingly and the Revenue shows the correct values. "Minimum Allotment contracted" - note the minimum allotment that you may have contracted with Booking.com because this may be a cause of overbooking after synchronization. Overbooking remains a risk, which is lower after synchronisation. Reservations can take up to 20 minutes to be loaded into the reservation list [our connection is performed based on the minimum time that the channel enables]. All channel reservations enter on the extranet with the status "Confirmed" and an email is sent to the hotel to report that you have a reservation. If the channel reservation has been edited, the status will remain as "Confirmed" (except for cancellations), but it will be as Unread (presented in bold) and a new e-mail is sent to inform the Hotel. For Channel Cancelled reservations, an email is sent to the Hotel to inform about the cancellation and the booking status changes to "Cancelled". Please be aware that all channel reservations are being managed by the channel and the guest itself. Channels normally do not send the guest email via XML, along with reservation details, so if you want to communicate with the client, you should access the guest contacts on the extranet of the channel and copy them to the Guestcentric. The credit card details can be viewed by clicking "View credit card details" (if applicable).